Hollie... I don't even have words. This week as been... hell. When I saw that I got a flat package in the mail, I was confused. I opened it up and what I saw made me literally cry. 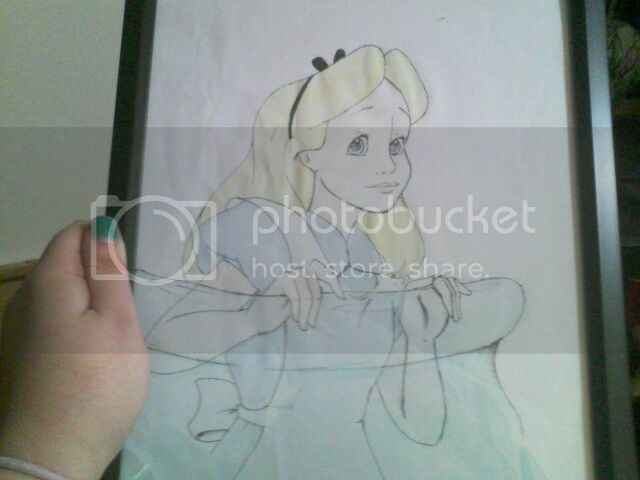 Your drawing of Alice is spot-on and I love it to pieces. I have it hanging right over my television. I cried because of the love and care that went into drawing that for me... a person you've never even met. In fact, it's getting hard to see what I'm typing through the tears. Alice means so much to me because, as a little girl, I felt like Alice... lost, lonely, sometimes feeling big and strong... most the time feeling very small... all in a world that didn't make sense. I've felt that way all this week too. 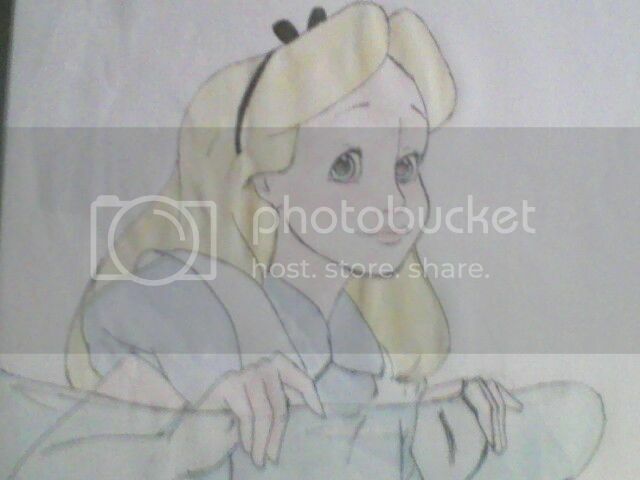 When I saw your drawing of Alice in the bottle, I cried. I remembered how small we all feel sometimes. I know that all of this probably sounds crazy... but you have no idea what that drawing means to me. will be posted to you shortly! Oh Hollie!!!! She's beautiful!!!! What size is she??? I want to get a nice frame for her. 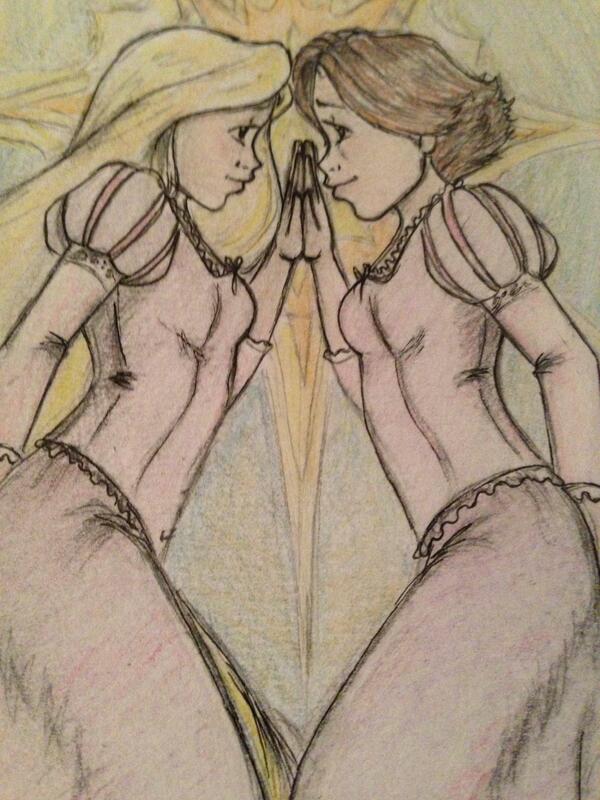 She's my favorite princess. I am sick and too lazy to post a picture at the moment, but I received a lovely drawing of Tick Tock Very interested to try the Cadbury Buttons since we have Cadbury here in Canada but I have never heard of these before. I. Love. My. Artwork. Like... it's stunning. Your artwork is so beautiful online, but seeing it in person with all of the little details... it's amazing. You're so talented and so thoughtful. I love it. Here it is! Commence the "ooo" and "aaaah"-ing!! This picture is the background on my phone now. <3 I love love love it. Thank you, Hollie. You bring so much joy to eveyone here, and when ever I get stressed or frustrated or am just not feeling myself, I will always have this picture to make me happy again!! Thank you, love!! I'm so lucky to have you as a friend. I WONDERED WJAT WOKE ME heeeheeeheee. thank you for your loveness! Sorry to wake you up with my shrieking, hahaha! !